Ok, this would be the perfect situation for me right now, an isolated cabin, somewhere in the middle of snowy land. Imagine how quite it would be here, no kids screaming, no cars, no annoying neighbours. Aaaaaaaaah, bliss! 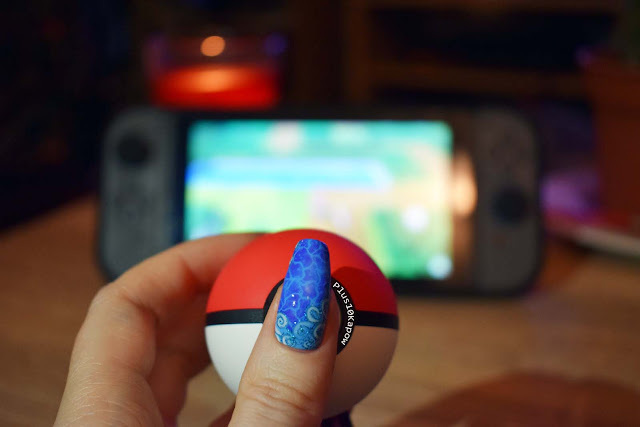 If I can't get there in real life, I'll just do it on my nails. 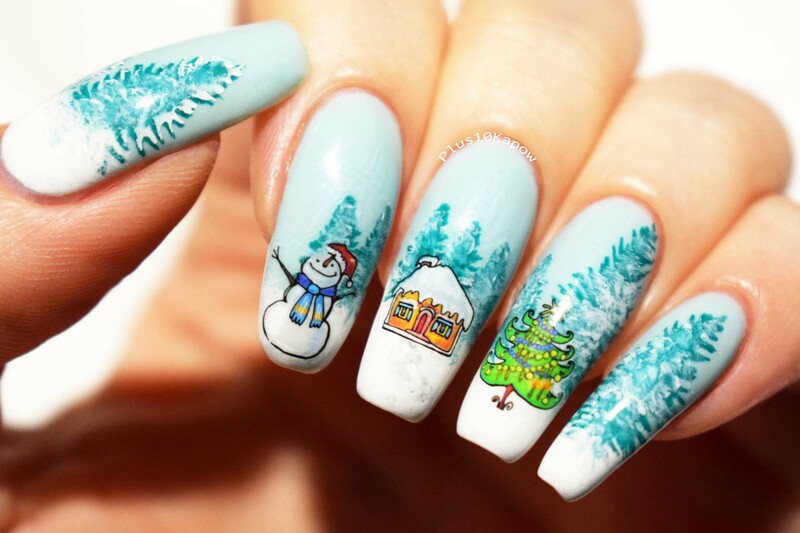 The snowman, cabin and Christmas tree are all decals from the Winter Wonderland decal set from Charlie's Nail Art, just 89p a pack. 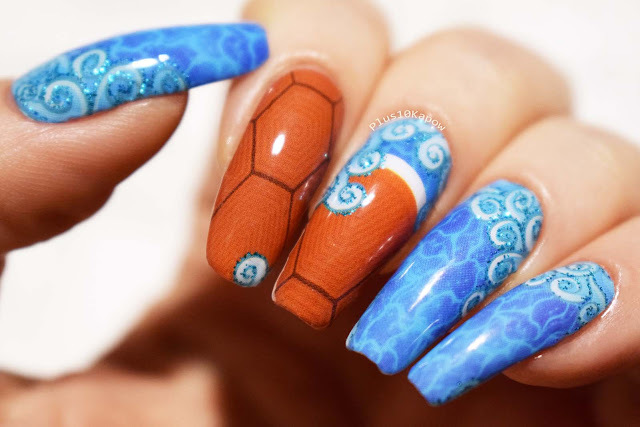 These are fun little decals, individually sized, the slide right off the paper after only a few seconds in the water and they are so easy to put on the nail. You'll notice that part of the snowman's hat and head are missing, that is because of a twitch right at the last moment (always) and not an issue with the decal. 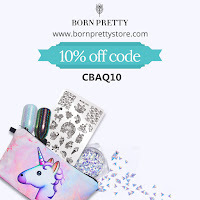 I also used BP-L011 from Born Pretty Store to stamp the trees. I'm just going to sit here and imagine being in this cabin, what would be your perfect place to be right now? Candy canes... another Christmas staple, don't you think?! I don't really put them on the tree much anymore but we do always have some around this time, it's just one of those things that will always feel Christmassy to me, plus they are pretty tasty. This is my second nail art for BMGLITZMAS! 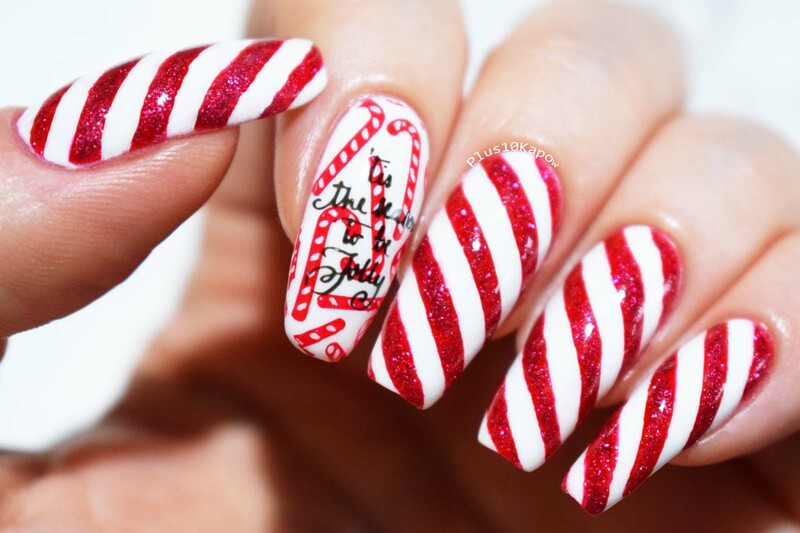 Yes, ok, these candy cane nails have been done loads before but I think if you don't have a candy cane nail at some point in the next month, are you even doing Christmas nails at all? Also, I kind of just wanted an excuse to use Ruby Slippers over Siren again. Polishes used: Barry M Cotton, Black Forest, Siren and Ruby Slippers, with Plumpy topcoat to finish. 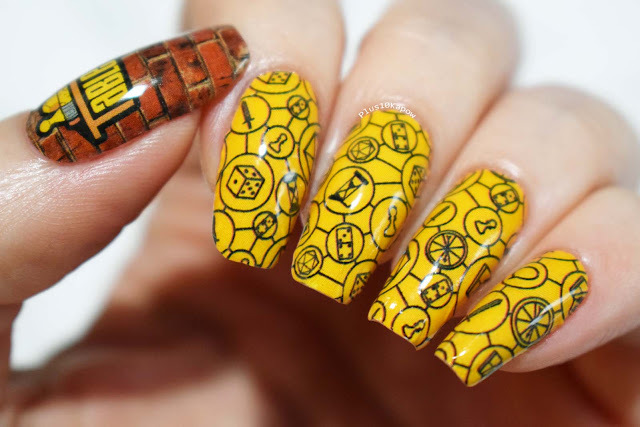 Doesn't Siren stamp fantastically?! It's a gorge red, very close to when you use it as a normal polish, instead of the pinky colour some reds stamp. It definitely is starting to feel like the "season to be jolly", if you ignore all the rain and wind! What is one of your weirdest Christmas traditions? I'm not sure we have any weird traditions, in fact, I don't think we have any traditions really, but it's so interesting to hear other people's. 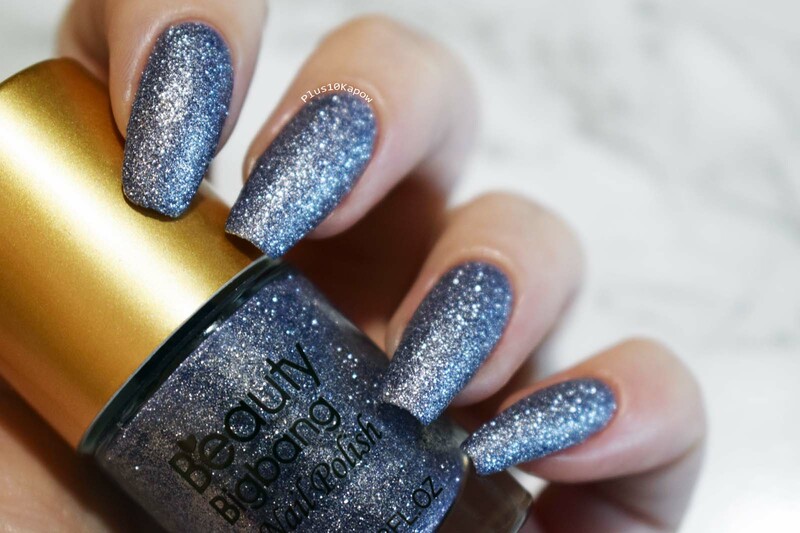 All polishes are available from the Barry M website and Superdrug. 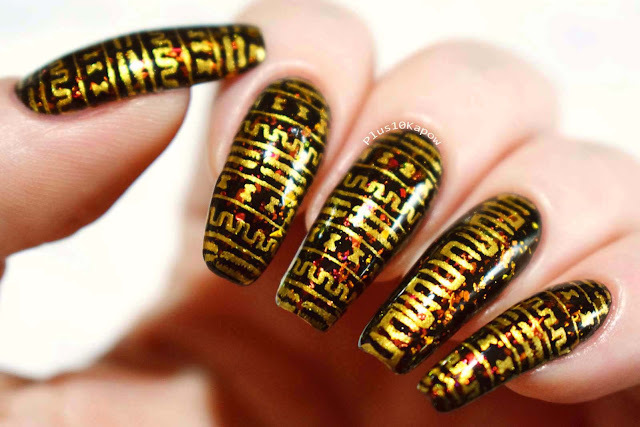 I was very kindly sent this beautiful Uberchic Culture Rich stamping plate to review by Alex of Nail Artisan. 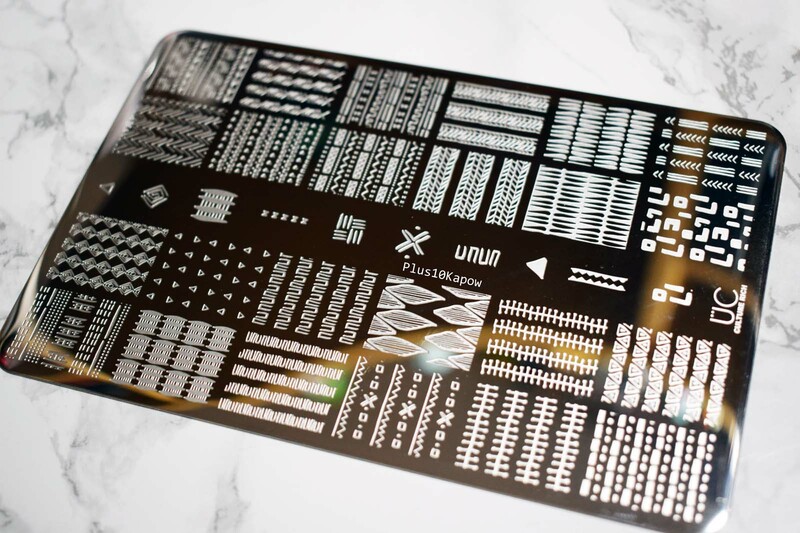 It is an XL plate with 24 full sized nail images and 10 smaller images, this would be a fab plate for layering and for tribal-esque nail art. As always with Uberchic plates, the images are etched perfectly, although you do have to get the scrape method down to a tee, and the scraper has to be almost flat against the plate and depending on your current scrape method this could take a bit of getting used to. I found that any stamper will pick the images up off this plate almost perfectly, with marshmallow stampers doing the best. There were zero imperfections. I did 3 different looks to test the plate out, and I absolutely adore how they all turned out, although not all of them photographed as well as I had hoped, I have gotta to find a way to correct my camera on certain colours. Polishes used will be listed below the photos. You can find this plate on the Nail Artisan website here for £12.75 +p&p. I was very lucky to be asked again to collaborate with Barry M for BMGLITZMAS and of course I said yes. 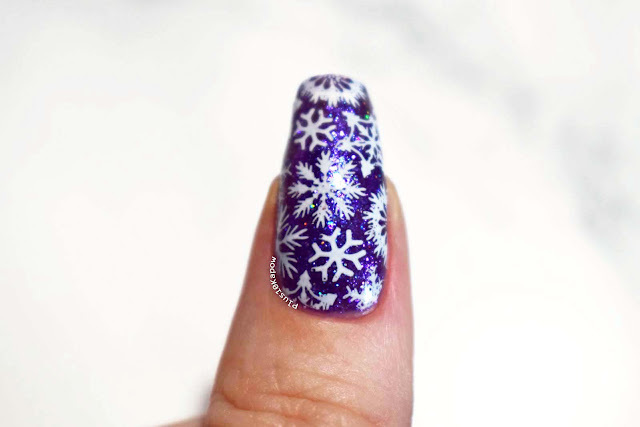 They sent over a few of their current Christmassy and sparkly polishes for me to work with and come up with holiday designs and the first design I wanted to try was this. The ugly Christmas jumpers have become a thing now and everyone loves them, me included. I would absolutely love to have one as sparkly as this, who wouldn't? I used Siren with one coat of Ruby Slippers, together they make a stunning sparkly red, then I stamped using Cotton and finished off with a coat of Plumpy topcoat. I used Uberchic Christmas 01 for the stamping. 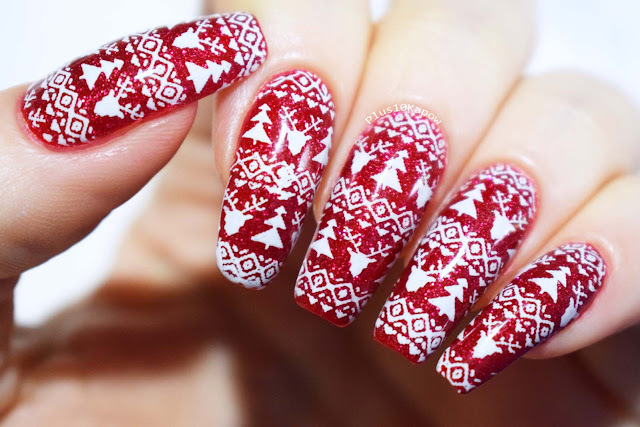 I have a lot more Christmas manis on the way in the next few weeks, are you ready for them? All these polishes are still available from the Barry M website or Superdrug. Yes, I am so ready for Christmas to begin now. I haven't gone as far as to put up my decorations yet but I came very close today. It snowed! I got so excited when we saw it. OK, so it was for all of 25 minutes and the floor was too wet for it to settle but I'll take it. 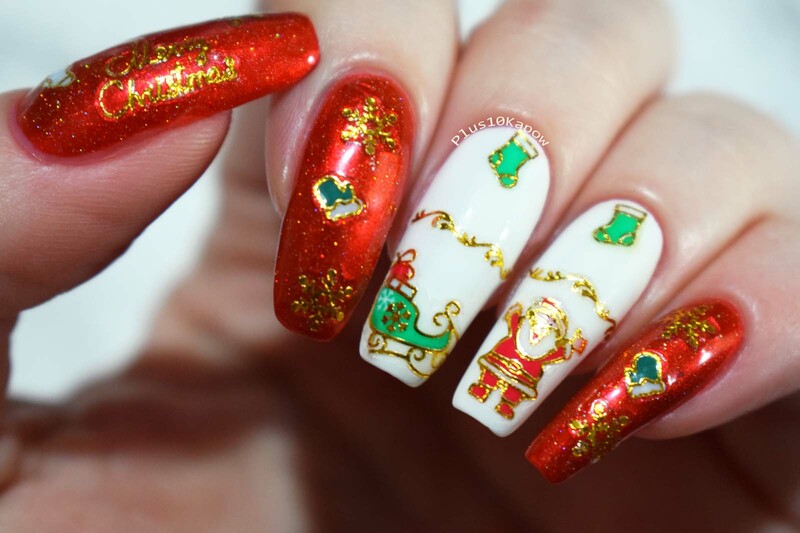 Anyway, now is definitely time for Christmas nail art to start and I thought I would get started with these adorable Christmas nail stickers very kindly sent over by the lovely Charlie of Charlie's Nail Art. This pack costs 99p and you could make it look like Christmas threw up all over you and still have some left over. 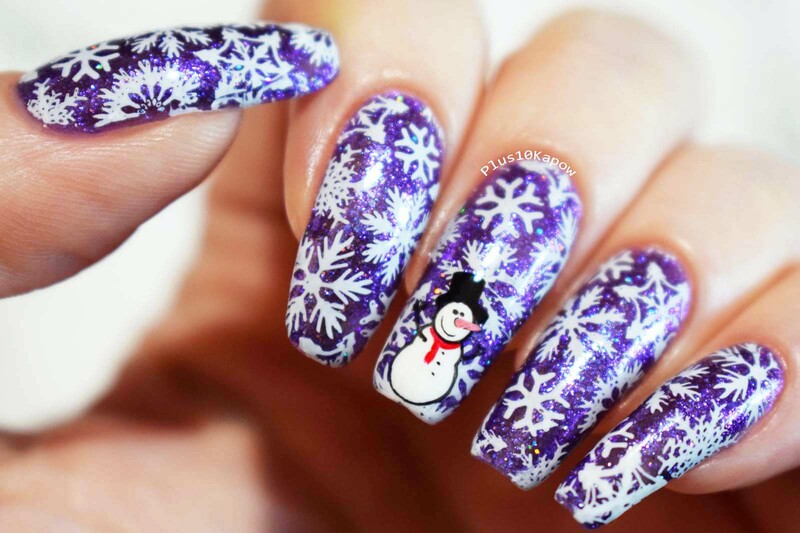 and don't forget o pop over and check out the Christmas nail art section to get some fun and adorable, festive nail goodies for pennies, ready for the party season. How ready are you for Christmas now? Kylo is not the best in social situations. She gets anxious and has a really nervous, bouncy energy about her. Owners and dogs alike can often interpret this into aggression and most don't understand that she just wants to play. We have tried doing all we can but it's just who she is, so we try to keep her out of those situations as much as possible. Although we would really love to find and young, energetic and playful down that we can frequently socialise her with to maybe make her feel less anxious, that just hasn't happened yet. Anyway, back to what I was saying, with this in mind, when those 'Pet Portait' days come up in local pets stores, we can't really go to them, but I would love to have a beautiful, professional looking photo of her gorgeous face. So, when we bought a photo backdrop not long ago, the first thing I decided to try was to do a pet portrait of Kylo. I mean, i have a pretty decent camera and I wouldn't say I'm terrible at using it either. Kylo was the perfect model, she sat down nicely, looked right at the camera, and I took 4 photos as a test, and all of them were absolutely perfect, this was the 3rd photo. Yes her blanket is minging, I know. But apart from that, it's perfect. We bought the photo backdrop from Amazon for £23.99, it is PVC and measures 100x200 cm. It's a pain to unroll and a pain to hang up somewhere, plus it has static and we still have dog hairs on it from this shoot. But I think it was worth it, don't you?! I am on the edge of whether or not I consider today's nail art a fail or not. On the nail I absolutely loved it but the more I have looked at the photos of it, the more I have started to hate it. This could be because the colouring in all but the above photo is completely off or because, in the photos, it just looks to busy. 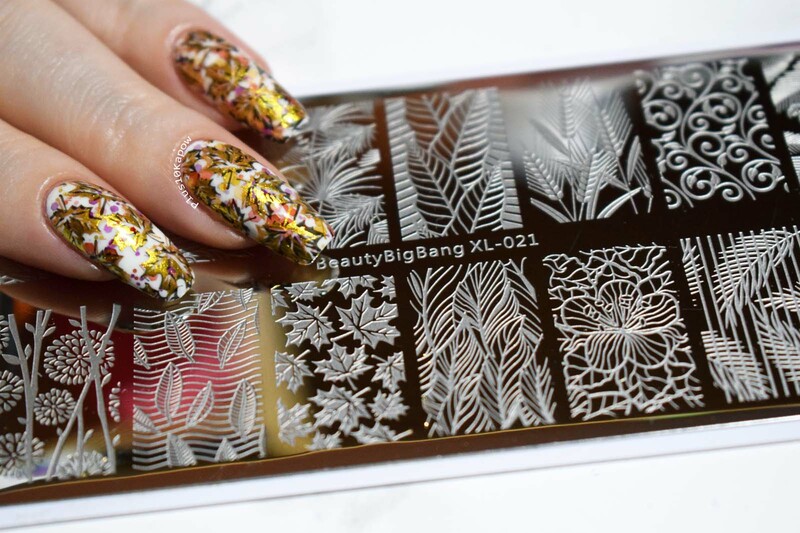 Anyway, today I am showing off the Beauty Big Bang XL-021 stamping plate, which is a fab plate with 14 fantastic, full nail images. 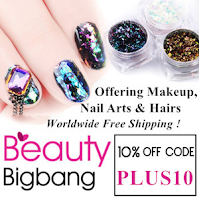 I have another beautiful Crystal Diamond polish from Beauty Big Bang to show you today. This is polish number 006 and it is a lilac leaning silver polish that dries to a textured finish, which I absolutely love! It dries quick and gives full coverage in 2 coats. 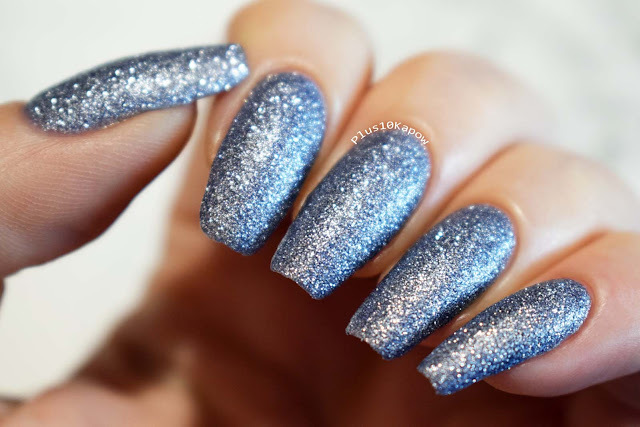 The textured finish is very close to that of Zoya Pixie Dust polishes. It is very sparkly even with topcoat but of course, I had to try it with topcoat. This is with one coat of Seche Vite and it does look much the same but with extra sparkle. Clean up and removal can be a bit tough as with most glitter/textured polishes but it does all come off in the end and there was no staining. These polishes are stunning and I really enjoy the textured finish, much more than with topcoat. 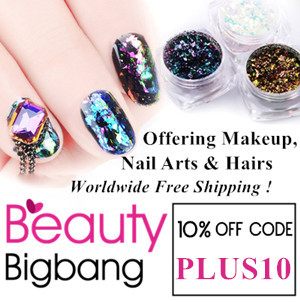 They have other colours available which you can fin by searching for 'Crystal Diamond' on their website but if you fancy buying this one, you can find it here for £2.07/$2.69 and don't forget to use code PLUS10 for 10% off your order. 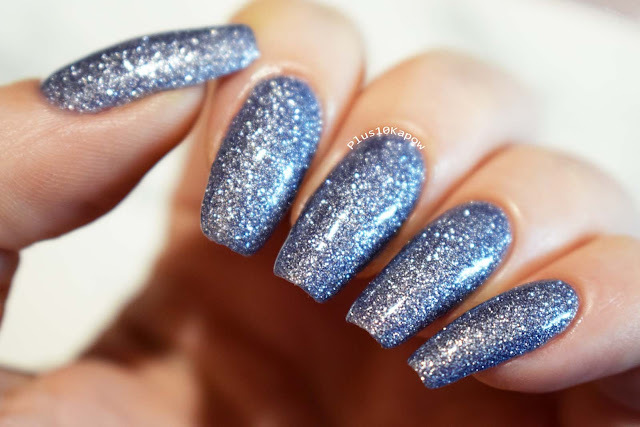 How do you feel about textured polishes? Today just felt like it needed to be a Spider-Man nails day! I was absolutely gutted when I hear the news about Stan Lee. This one man touched so many of our lives in such a profound way and the world was a brighter place with him in it. He taught each and every one of us that not all heroes wear capes. He will be greatly missed by a world in need. This year we have been talking a lot about Kylo's diet. Not knowing how old she actually is and worrying she might be quite a bit older than we think because of her increasing amount of white hairs, age was quite the concern for us and whether or not she is getting the right nutrients. Unable to originally find out her date of birth, we are going by her Microchip date and that would mean that she is at least 6 this coming March, at least! We also face the problem that Kylo has quite a sensitive tummy so changing foods can mean a few weeks of problematic poos and she over produces stomach acid so she has to have food in her stomach at set times throughout the day to ensure she doesn't puke bile. Anyway, not long after we had been discussing this, a sponsored post popped up on my Instagram for Tails.com. Which is weird because I never searched for any tailored food things on my phone, we just spoke about it within earshot of my phone. Further proof that phones are collection data by listening to our conversations, eek! I had a look into them and they seemed legit and I really liked the fact that the plans are all put together and tailored by vets and nutritionists. Plus, the introductory offer meant that I got 24 days of wet food, 2 weeks of dry food (although that ended up being more but I'll talk about that later), and one week of dental dailies for a grand total of £11.20, how could I pass up on that?! 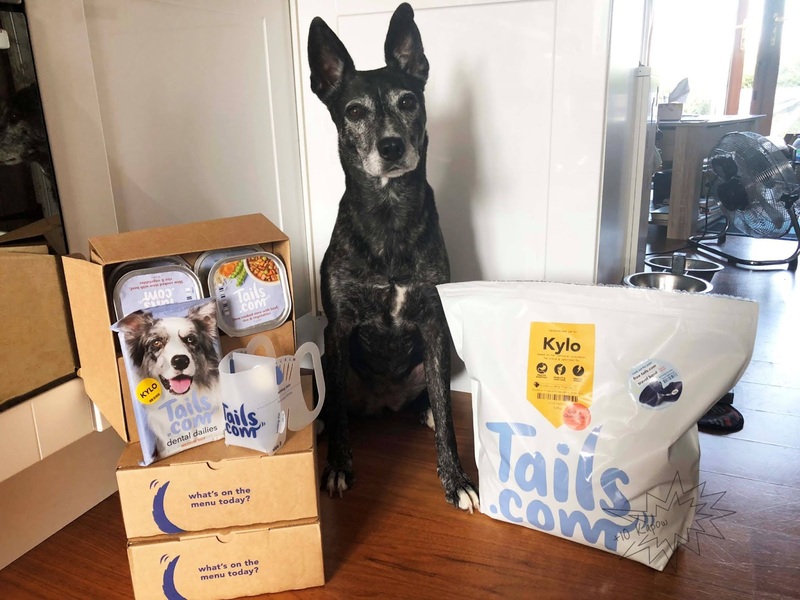 And I was quite happy to see that there was an option for dogs with sensitive stomachs, so Kylo's blend is for sensitive stomachs, active nutrition, calorie control and a small amount of senior nutrition. It also has ingredients in there to promote a healthy coat and healthy bones. The senior thing is quite important too, unlike your standard supermarket brands, Tails.com won't make you switch from "Adult" to "Senior" overnight. 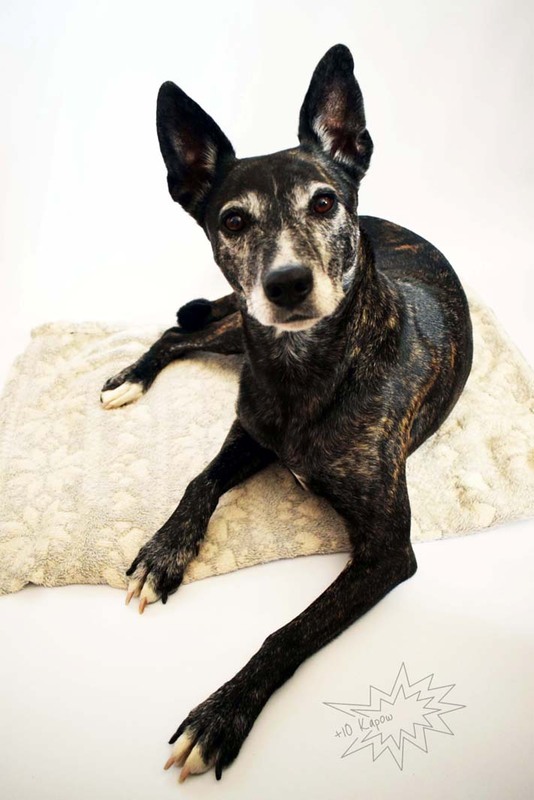 They adjust your dog's blend gradually age they age and they cater to breed specific issues and health conditions, which is great for that extra peace of mind as a dog parent. At the moment, aside from her sensitive stomach and epilepsy, Kylo is in fantastic health. She is her ideal body weight and she has great muscle composition but I like to keep on top of things as much as possible to stop my anxiety. Lets have a look at the food now. Let's just start by exclaiming how freakin' gorgeous these wraps look in this photo. I mean, that mesh detail just looks fantastic. 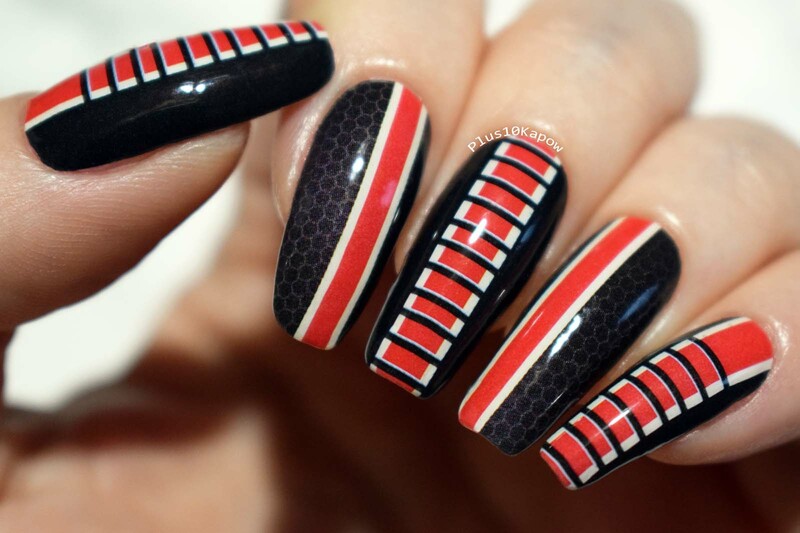 These beauties are the Sass Effect nail wraps from Espionage Cosmetics and I absolutely hear you saying "But Chrissie, N7 Day was on Wednesday!" Yes, I know and I was saving these wraps (yes, another pair I've been saving) for this years N7 Day but when Wednesday rolled around, I completely forgot until I started seeing all the posts and by then, my back had already been in spasm for a few hours so it just wasn't going to happen. I still really wanted to put them on ready for this week's regularly scheduled Espionage Cosmetics notd though and I am so glad I did, because they look awesome in the packet but with topcoat (Barry M Plumpy) they just look out of this world. Movember is an awareness raising month, where men shave freshly on November 1st and then don't shave again for the rest of the month to raise funds for for the Movember Foundation which they put towards groundbreaking work in prostrate cancer, testicular cancer, mental health and suicide prevention. 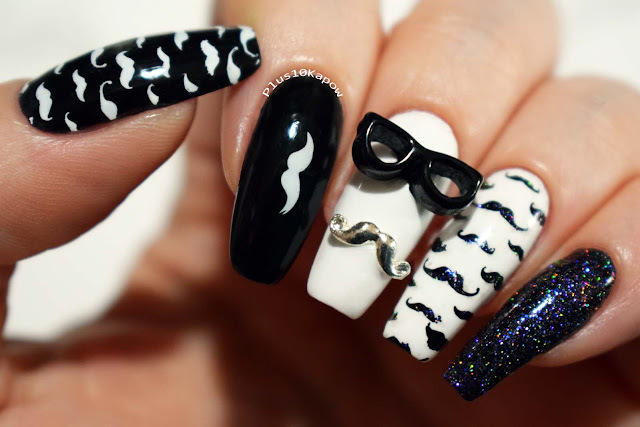 But I can't grow a moustache, so I put my "misstache" on my nails. All of us likely have a man in our life whose health we care about, be it a a Dad, partner, a son, a cousin, a nephew, a godson... they are all someone we care about and we hope they never do but a lot of health conditions men currently die young from are ones that could have been helped by early detection or communication and understanding. So lets get our men active in their own health and eradicate the "it'll be fine" responses we always get when saying they should see a doctor. You can find ways to donate here. The moustache charm and the glasses charm are both from Charlie's Nail Art and don't forget that you can use code CLPK10 for 10% off your Charlie's Nail Art order. As soon as I saw Alex from NailArtisan post this plate I had to have it. Of course I received it super quick as always and started coming up with ideas. I am definitely a sucker for nerdy or superhero stamping plates and having already owned a few MyOnlineShop plates before, I know that they stamp really well. 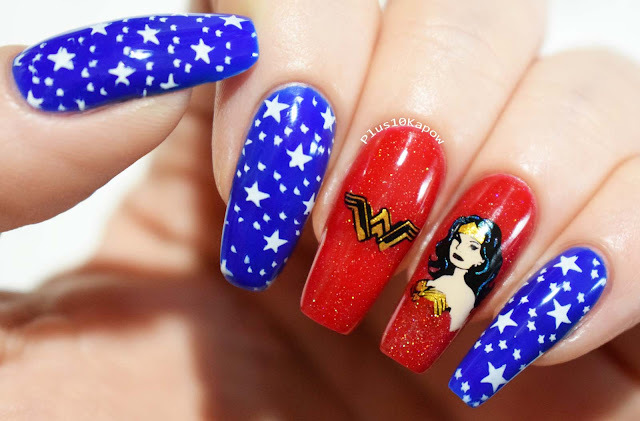 I was instantly drawn to the Wonder Woman images and set about doing the Wonder Woman mani first. For this is used a base of Barry M Blood Orange for the red nails and topped those with a coat of Wikkid Polish Gold Dust. For the blue nails I used Barry M Blue Grape and stamped the full nail stars image in Barry M Cotton. I used Moyou Black Knight and Born Pretty Store Gold stamping polish for the Wonder Woman stamping with Colors By Llarowe Be Bold in Blue for the highlights in her hair and Barry M Lychee for her skin. All topped with a coat of Seche Vite. It was so hard to get a decent image of this plate showing all the images clearly, I definitely need to sort out a better way to take stamping plate photos. The plate has 9 large, full size nail images, 2 small full size nail images, 1 XL image that would fit across multiple nails and then 43 smaller images. 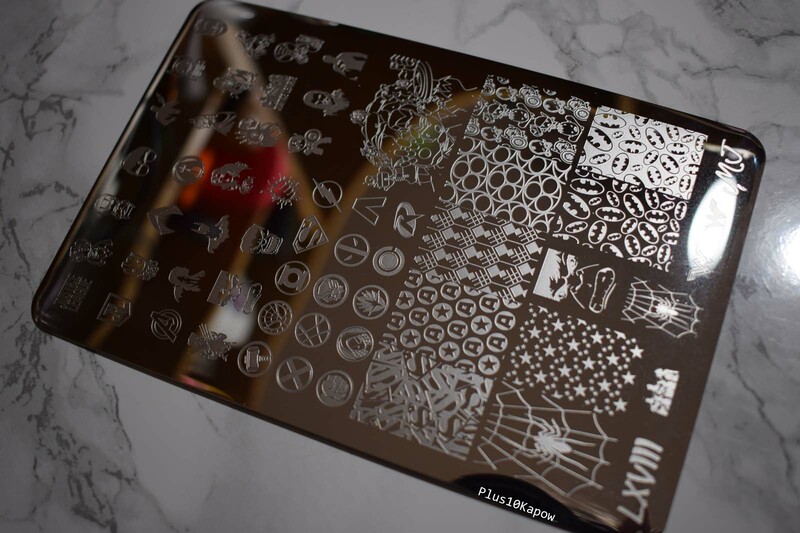 This is a great range of images that are great for reverse stamping and regular stamping with lots of recognisable superhero faces and symbols and even a Daenerys image thrown in randomly. I really like the superhero/alter ego silhouette images and would have loved a few more of these to show up on this plate. Overall the plates images are etched well and stamp really well on first pick up but some of the large nail images do have gap that need to be filled in after stamping. I can see no actual physical imperfections on the plate though. 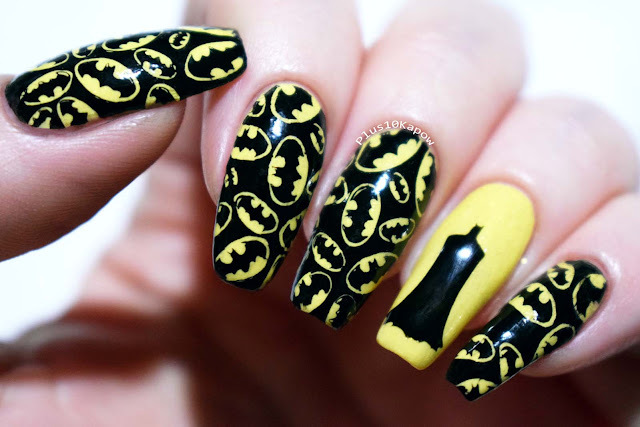 My second mani was one that just had to be done, a Batman one! Ok, so I have done one nail using a TwinkledT Batman vinyl but for the rest of the nails I stamped using Moyou Black Knight and the inverted Batman image bottom row on the right. For the base I used a super old Barry M textured polish, Station Road, which has a gorgeous gold shimmer to it and looks great topped with a coat of Seche Vite. 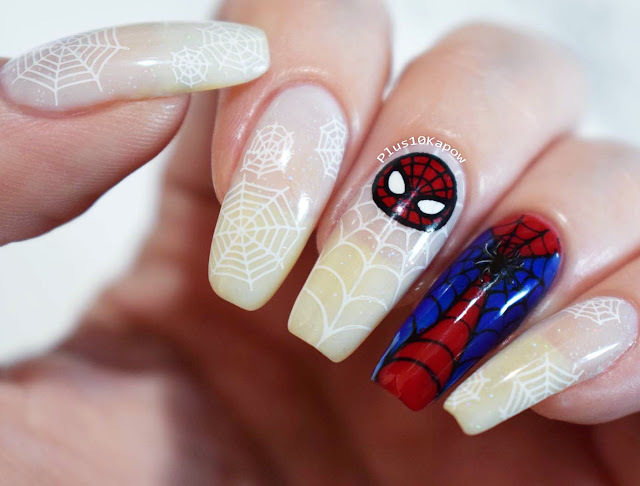 What nail art would you do first using this plate? I feel like I am fully on track this week, I have got posts ready to go up and I have done some nail art today and I have have a few possible post ideas. 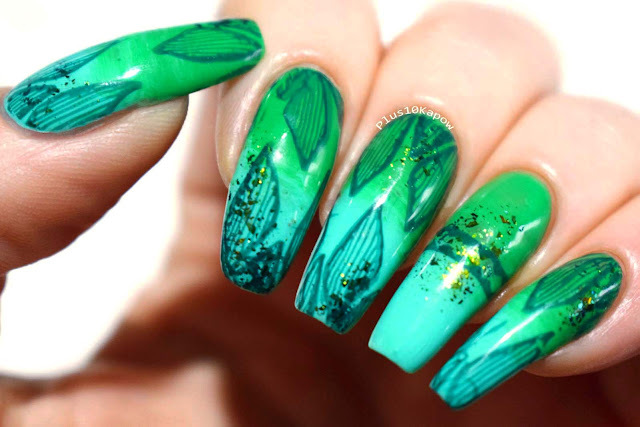 Going back to today though, I have 2 looks done using the Beauty Big Bang XL-017 stamping plate. I really like this plate. 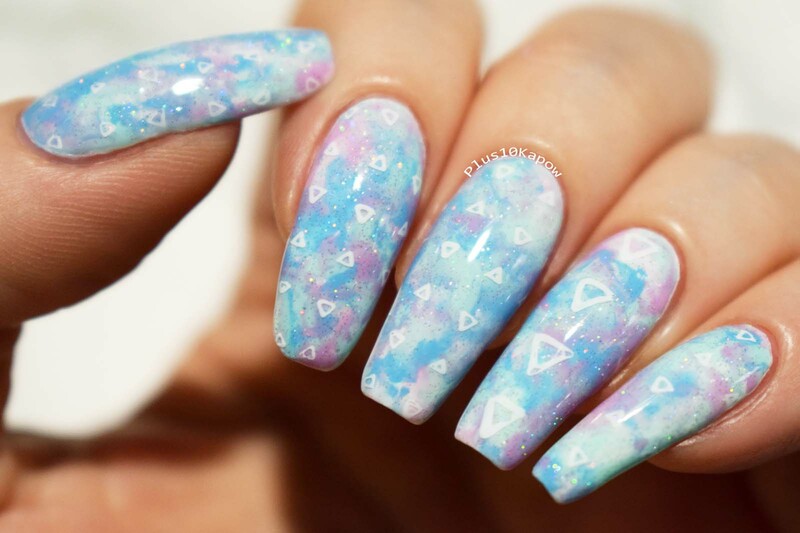 It has 14 full nail designs and they are all fun patterns. Some of them can be used for reverse stamping but I think these images are more suited for regular stamping. I have been super slack lately, the last week I have done one post and not only that, the weeks I have actually posted, it has all been nail stuff, so I am going to try and at least post some little other bits in between the nail stuff and what better way than with a Kylo related post. We have had this coat since August but didn't really get to use it much until the last few weeks but we got it in preparation for the rain and cold. We had been trying to find a coat that fit in with what we and Kylo wanted in a coat. It had to be waterproof, with a warm layer, no hood (Kylo hates things on her head), with reflectors/light and most importantly, it had to have a hole for her harness clip. 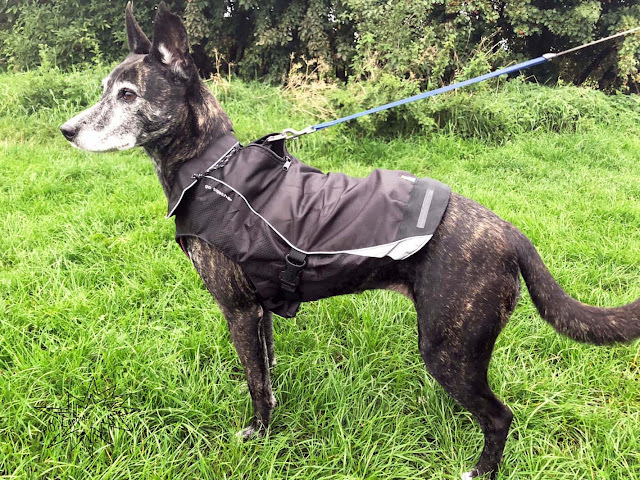 Finding a coat with a harness hole, in the right place, seemed near impossible and we were starting to think that we would just have to settle and modify. Then we spotted this Kurgo coat on Amazon. Now, I'm not going to pretend that I have any idea about how to review a coat for a dog but I'm just going to tell you about it as best I can. Who is watching Blizzcon? We've been making the most of our Virtual Ticket. You may know that I am a big fan of Blizzard and that my favourite game ever is Diablo 3 with Heroes of the Storm a close second. The opening ceremony didn't go quite the way some of us had hoped but I think there is still a lot to be excited about. Most of all, how amazing is Ashe, the new character in Overwatch? Did you see the Deadlock Rebels release from Loungelfy? Or the World of Warcraft release from Her Universe? So much awesome! 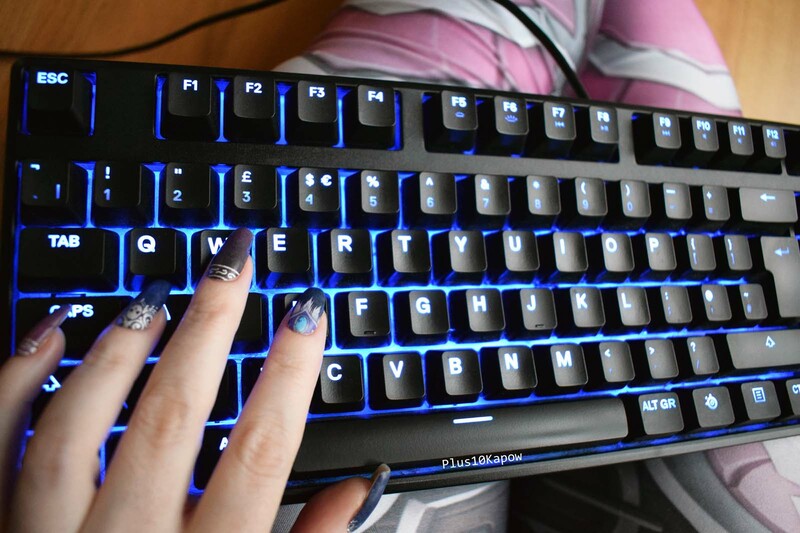 You should also check out all the Blizzard leggings from Wild Bangarang. They are absolutely fantastic, they have Warcraft and Overwatch and they are official Blizzard partners. I am wearing the Sylvanas Legion leggings in the above photo (not that you can see them very well, but trust me they are amazing). Obviously I was really hoping to see new of a Diablo 4 and we all know by now how the Diablo panel went. All I am going to say about that it that I will definitely give Diablo Immortal a go and after finding this blog post from them, I will still wait excitedly, but patiently for news on the next Diablo project. Also, big shoutout to Team UK for their win against Team USA and good luck to them moving on the the Overwatch World Cup.